So may people have enjoyed the Pageant of the Masters theme this year as it focuses much of its spotlight on the plein air painters who came to Laguna Beach to paint its iconic scenery. And now, we have yet another spotlight on the modern day painters themselves this Saturday, Aug. 25th. This Saturday marks the 100-year anniversary of the Laguna Plein Air Painters Association LPAPA). To celebrate the official day on which the original Laguna Beach Art Association was founded in 1918, the Laguna Art Museum has invited LPAPA as one of its Community Arts Partners to join the LBAA Birthday Party celebration this Saturday, Aug 25, with a LPAPA Paint Out En Plein Air at Heisler Park. 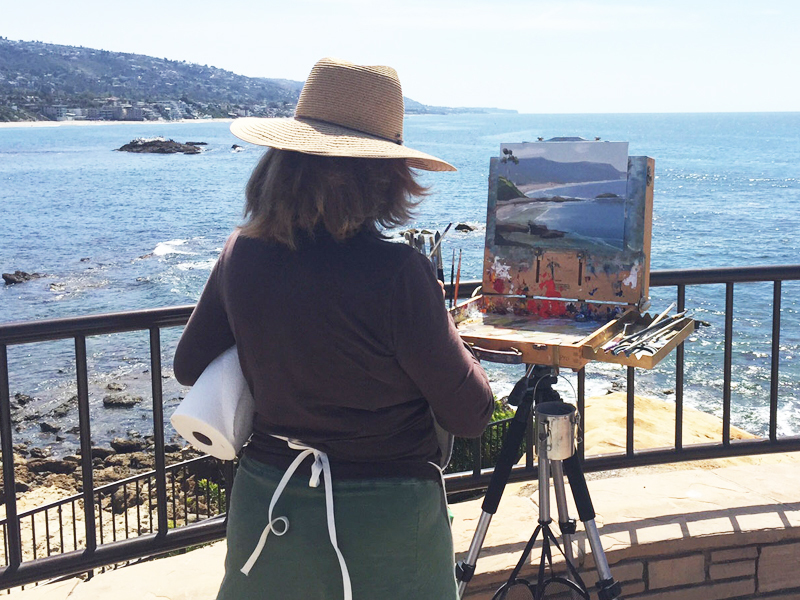 The Plein Air Paint Out event will begin at 9 a.m. with artists painting en plein air throughout Heisler Park. This is a free outdoor event presented in collaboration with the museum’s LBAA Birthday Party Celebration that starts at 10 a.m. with free docent-led exhibition tours at the museum. LPAPA artists’ work created during the Grand Paint Out for the “Centennial Celebration Plein Air Exhibition” will be on exhibit and available for purchase at LPAPA in Residence, at the Forest & Ocean Gallery located at 480 Ocean Ave. Join them Saturday, Aug 25 at 5:30 p.m. as they announce the Plein Air Paint Out award winners. The artwork will be exhibited and available for purchase at the gallery until Sept. 4th.